In the past I have written about how difficult it is for some disabled people to find truly accessible toilets. If you are able-bodied, it is easy to forget how devastating this can be. If you are able-bodied, it is easy to forget that thousands of people rely on bathrooms and toilets with disabled access. It is also easy to forget that it could be you who needs disabled bathrooms one day. I never expected to raise a child with special needs and it has made me think much more about the way we attempt to include those with disabilities in our society. For example, why aren’t all bathrooms designed to be more friendly for the elderly and those with disability problems? If you take a quick look at the beautiful bathrooms from bathing solutions, you can see that these bathrooms stylish and indistinguishable from any bathroom. There are just a few added extras that may make a disabled or elderly person’s life easier. I dream of one day being able to afford a new bathroom that is beautifully designed and luxurious. But, until recently, I would not have thought that disabled bathrooms and the perfect bathrooms in my mind could ever be the one-and-the-same. Why not? Far too often, there is a stigma attached. There is the sense that the facilities and design in a more accessible bathroom must somehow be more cumbersome and less attractive than a conventional bathroom. This doesn’t have to be the case. 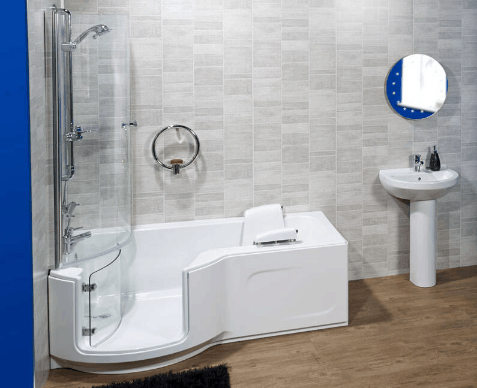 If you have problems with mobility, you can still have a beautiful and comfortable bathroom. If I can ever afford a new bathroom I would love it to be like the ones pictured above. With an aging population, it makes even more sense that such facilities become more common place. We all have older relatives who would benefit from this too. There is also the sense that these modifications are for a minority, that small allowances are enough, because their voices are few in a sea of many. Even the most inclusive of initiatives is still inclusion. We attempt to bring those who do not fit easily into a circle where the conventional majority operate. If and when we become a truly inclusive society, the word inclusion will no longer be needed. One day, if we value progression, disabled bathrooms will just be bathrooms. Great article, thank you. I think all new properties should be accessible by default, with exceptions made only with good reason. It’s sad to realise that in the reasons for this not being the case, the space required probably comes a close second to prejudice. That culturally most people are conditioned to associate anything relating to disability with ugliness and negativity, often to the point where they don’t even know they’re doing it. And it’s so ridiculous when so much of disability-related design can be beautiful or cool, provided designers with knowledge and a positive attitude are doing the work. The example above is lovely. Does anyone have any experience with the walk in baths from Gainsborough? I’ve been thinking about getting one of theirs installed but could do with some advice.